Dumpster diving is a hobby that centers on the preservation of objects, regardless whether discarded by an individual or a company. Any dumpster is fair game for the diver and motivations can run the gamut of profit, ethics, or simply adventure. One thing is certain, dumpster diving has become a national trend. 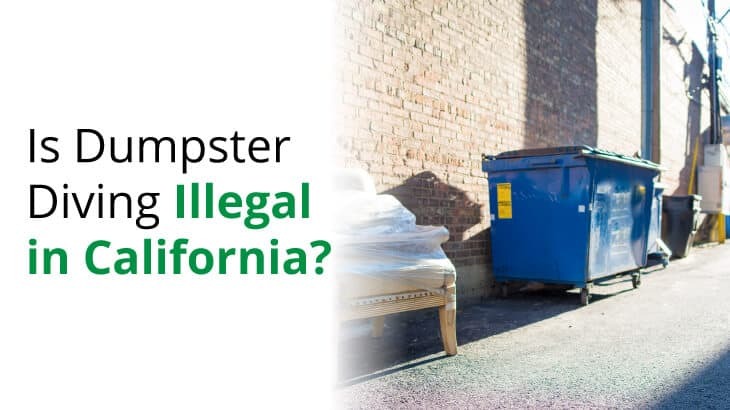 When you think about California and the dumpster diving industry, you might assume California law, like the state, is progressive. But California’s “do as you please” repute does not necessarily apply in the area of dumpster diving. The old adage, “One man’s junk is another man’s treasure” finds its very legal roots in the State of California through the 1988 United States Supreme Court Case, California vs. Greenwood. Greenwood is the pivotal case that now gives dumpster divers authority to dive in to refuse containers in search of discarded treasure. Greenwood’scentral issue had to do with a defendant attempting to suppress evidence that the police uncovered while searching his garbage container at the curb. The Supreme Court’s ruling gave authority in its dicta that summarily stated, when an individual discards items into the trash – or dumpster – the discarded item enters the “public domain” and it becomes subject to the legal search and recovery by another. Certainly, there is a difference between a police search and a dumpster dive. But the basic premise is the same for any one who seeks to recover discarded items from the trash. If the search is not subject to other legal protections, it is available to the dumpster diver for whatever reason or motivation. Taking its cue from Greenwood, California does not specifically make it illegal to dumpster dive. 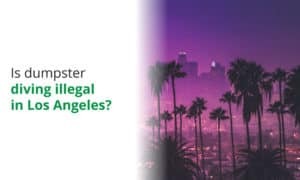 However, it is important to understand that, while dumpster diving is not illegal in California per se, most people arrested for dumpster diving have violated other municipal laws during the activity and can face criminal prosecution under local laws. California dumpster divers beware! It is important to know that California passed a statewide law that specifically outlaws the act of “scavenging”. Scavenging is defined as removing recyclable material from a recycle bin or container without the express authority of the premise owner. Scavenging is strictly prohibited by anyone other than the a city-approved recycling company. Under California law, scavenging is considered the crime of theft and most municipalities will prosecute the violator of the law severely. 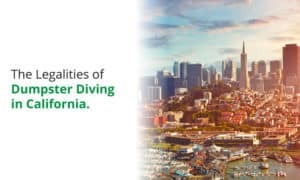 Dumpster diving has a tremendous following in California, but it is important to understand the laws of each city when you decide to forage in the community. The following shows you how to research your local area to determine whether your city or town has specific restrictions on dumpster diving. The following provides examples for four cities in California. General: Under a search for the city of Los Angeles, the following ordinance was found: “No person other than the owner or the operator of the premises on which the market waste containers are located…shall tamper or remove any material from a market waste container.” Los Angeles Municipal Code Chapter 5, Article 6, Sec. 66.24. It appears there may be restrictions against dumpster diving on private property. Exceptions: Los Angeles has laws against littering and damaging, trespass, and disorderly conduct. 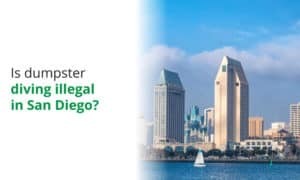 General: Under a search for the city of San Diego, it is determined that dumpster diving is legal in San Diego based upon California vs. Greenwood. Exceptions: San Diego has laws against littering and damaging, trespass, and disorderly conduct. San Diego is very strict on the crime of scavenging from recyclable bins and containers. On San Diego’s city website, there is contact notice to report scavenging, which is a misdemeanor theft offense. 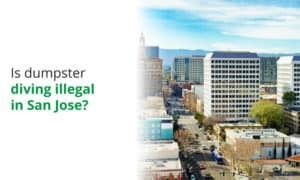 Is Dumpster Diving Illegal in San Jose? General: Under a search for the city of San Jose, it is determined that dumpster diving is legal in San Jose based upon California vs. Greenwood. Exceptions: San Jose does not have any specific laws against dumpster diving, subject to littering, trespass, and disorderly conduct. 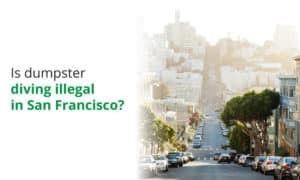 Is Dumpster Diving Illegal in San Francisco? General: Under a search for the city of San Francisco, it is determined that dumpster diving is legal in San Francisco based upon California vs. Greenwood. Exceptions: San Jose has no specific law against dumpster diving, subject to littering, trespass and disorderly conduct. It is wise to check each community ordinance before a dumpster dive. There are plenty of sites to search, such as the city hall, police department, and local websites. Following the laws of each community, as well as the dumpster diving “code of ethics”, you are sure to take your hobby to a new level of enjoyment. Disclaimer: the information contained in this website is not intended to provide legal advice in any manner. Any information contained herein is offered solely as information and no representation is made that the information is true, accurate, or complete. You should not rely on this information as legal advice or rely on it in lieu of the advice of an attorney or lawyer. If you have questions about the information contained or need legal advice as to laws in your area, you should seek the advice of an attorney.